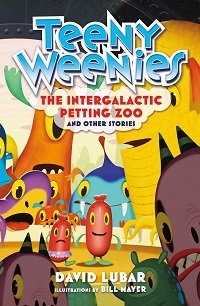 The Intergalactic Petting Zoo and Other Stories, the first book in the Teeny Weenies series, gives young readers twelve stories to set their imagination soaring and reeling. Offering fantasy, science fiction, weird real life, and just a touch of icky horror, these stories are marvelously illustrated throughout with drawings by award-winning artist Bill Mayer. A boy and his sister visit a petting zoo that is out of this world. A community pool fills up with bullies. Fourth of July fireworks awaken a monster. Two girls learn about "The Left Hand of Dorkiness." Readers will enjoy amazing encounters with wild bulls, enormous sharks, fun-loving zombies, and more in this premier collection of bite-sized treats.